Like more animals on this website this medium sized beetle was living in my little gardenpond. By the suckingdiscs at its frontlegs you can see it's a male. This beetle is not uncommon. Hydaticus transversalis differs form this species by a yellow stripe across (transverse) the elytra. 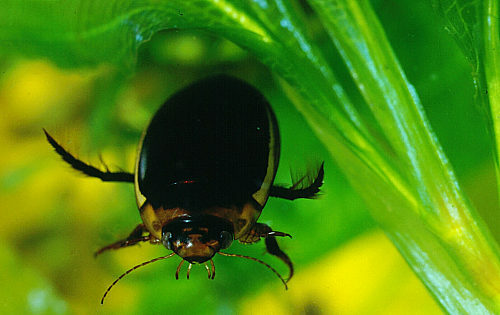 This beetle is also a member of the dytiscidae family.